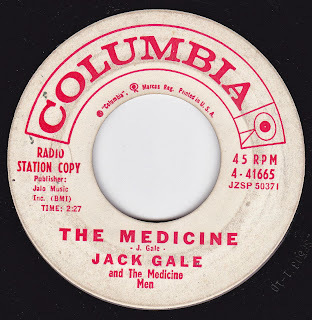 45rpm based blog featuring the weirder side of Mid 20th Century music including wild instrumentals, weirdo teen, rockabilly, soul, mod and just plain crazy. 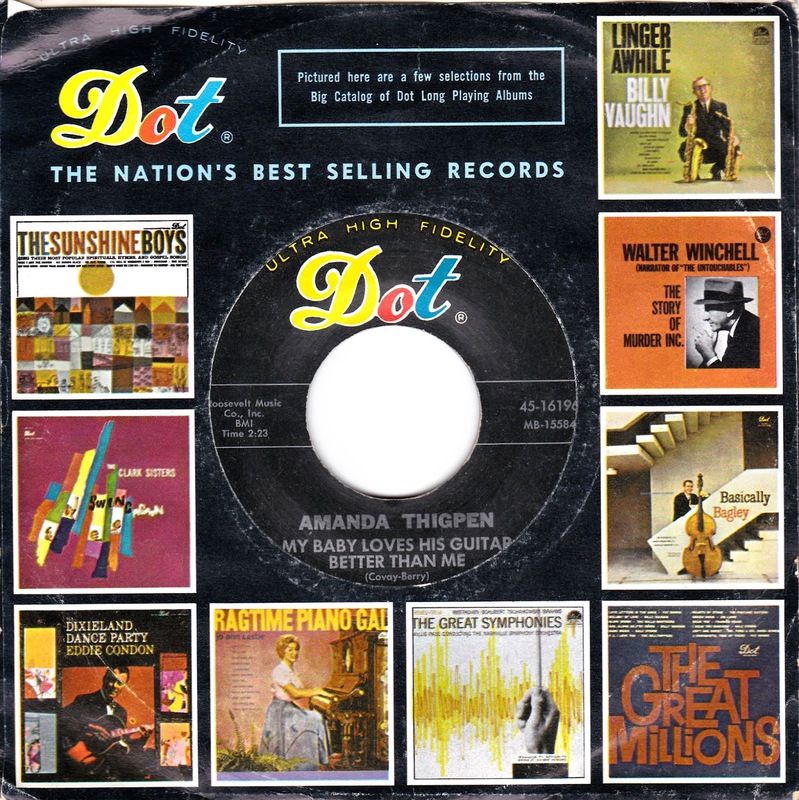 All 45's posted will be almost exclusively from the 1940's to the 1970's, but mostly 50's and 60's. Will also feature some plain good old 45's from time to time. Enjoy! Poor Girl! Her baby loves his guitar better than her. He takes it everywhere, but there's something about him that she still loves even though she plays "second fiddle" to that darn guitar. 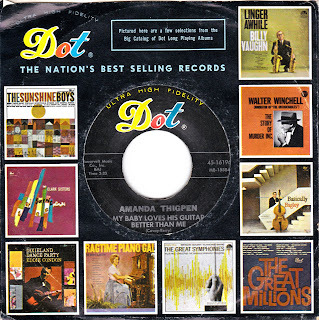 Amanda Thigpen seems to have been mainly a club singer during the 1950's and was vocalist for a short period with The Red Caps. 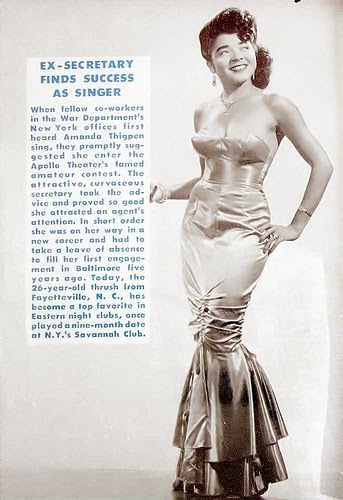 She appeared in Hue Magazine and it was noted that she was a former secretary turned singer. For Underwater Man, a guy skin diving meets a mermaid and they fall in love. The problem is, he can't live underwater and she can't live on land. He comes up with a great solution which you will hear at the end of the record. The highlight of this record for me is the gurgling underwater talking. Weirdness!! For My Evil Eye, he uses his powers from his evil eye to get the chicks. Includes the creepy lyrics, "When I get a girl wrapped up in my arms. And if she gets afraid that I'll do her some harm. I can make her stay when she wants to go. Make her say yay when she want's to say no. Ain't tellin' no lie. It's my evil eye." Super cool organ sounds on this one and a good beat. Couldn't find any info on Jim other than the fact that he had another record (assuming it's the same Jim Cannon) on the Memphis Label with the tracks, Stagger-Stumble-Fall and Highway Fever. Are you and your friends feeling sick or hungover? Well then it's time to do The Medicine! Just follow along and "Form a great big sick looking line." Then when Jack says hit it, "Take your temperature, a glass of Rolo Seltzer (?) and swallow 3 one a day brand vitamins. HIT IT!!" The Sloppy Madison is more of the same nuttyness. "When I say hit it, go into the birdland, then spin out of it and form that big G. G for Gale? No, G for garbage. Someone forgot to take it out. Hit it!!! Cray-zee!!" 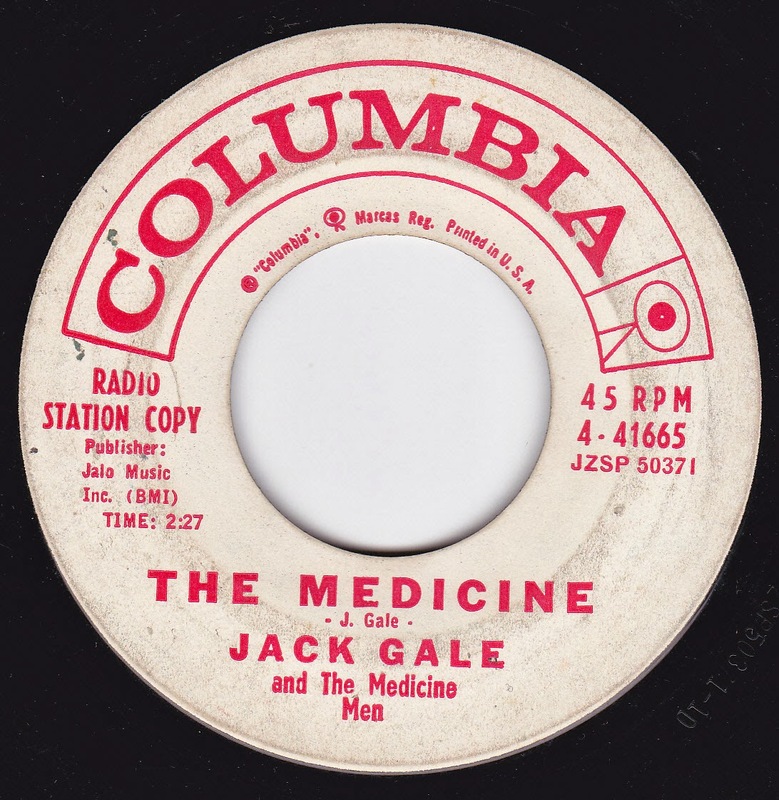 Jack Gale is a radio personality, producer, voice over artist, record label owner and writer. Back in 1962 he did this funny take on the dance, The Madison. You can read more about Jack HERE. 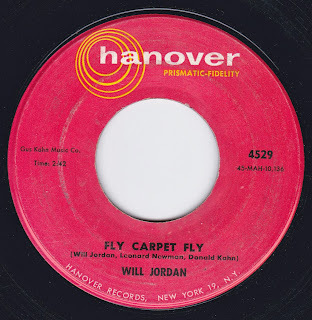 Will Jordan was a comedian and impersonator who is most famous for his impressions of Ed Sullivan. He actually appeared on the January 6th 1957 Sullivan show which also featured a young female comedian named Carol Burnett and the third and final appearance by some guy named Elvis Presley. Jordan has also subsequently appeared as Sullivan in the 1983 Billy Joel Music Video of Tell Her About It and the 2003 film Down With Love. The middle eastern character he portrays on this 45 (Sabu?) apparently inspired a character for Lenny Bruce and he was apparently a big influence for Lenny Bruce in general. The song itself is about the character going on an adventure on a Persian rug. My favorite part is near the end when he breaks character and switches to a New York accent. 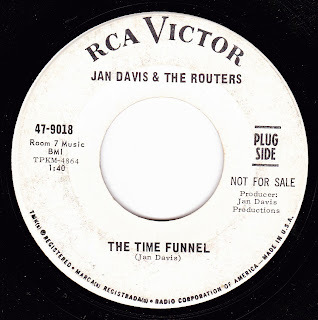 What better way to start the blog off than with a blood curdling scream and some amazing surfy instrumental sounds from Jan Davis & the Routers. The clock ticks and suddenly we are taken into another time. Is it the past or the future? Decide for yourself. Unfortunately, he apparently never hit the charts in the sixties but Sundazed released a retrospective of his music several years back which you should be able to find. 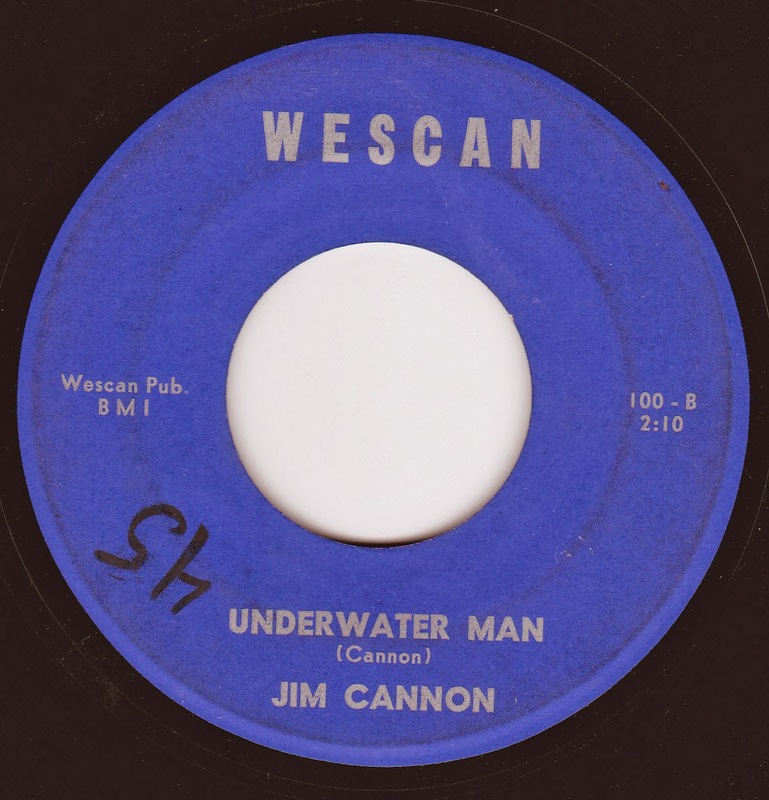 He has also been featured on the "Lost Legends of Surf Guitar" series. Collector of 45's, Pulp Paperbacks, 1950's and 60's comics, LP's, books and all kinds of other crap. 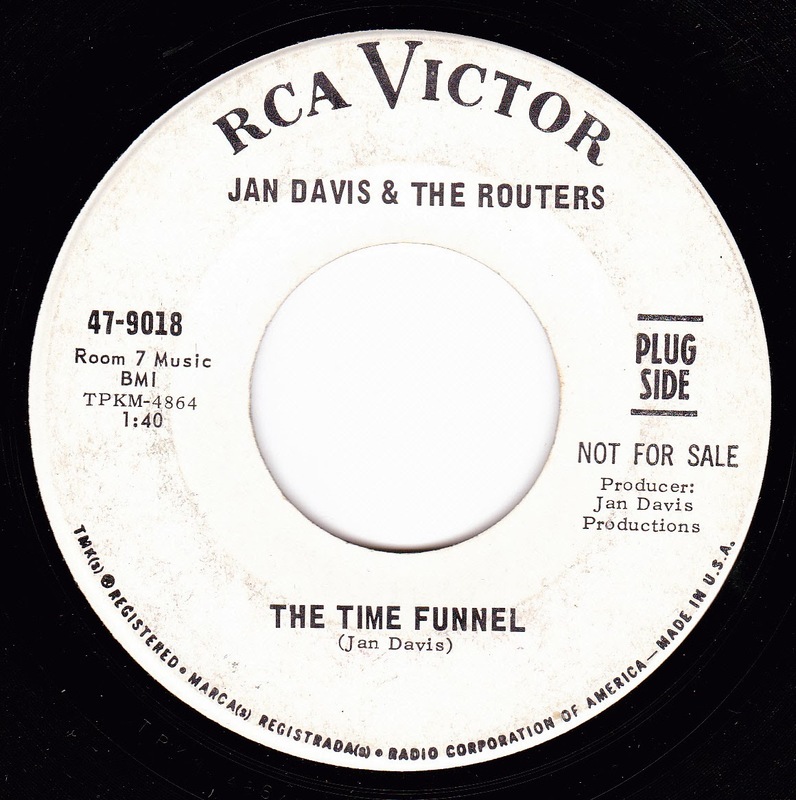 The sound files posted here are all taken from the original records, so you may hear some pops and slight noise. If you dig the sounds, if available, go buy the music and support the artists. Please donate to keep the blog going strong!